Ephesus is the biggest and best-preserved ancient city in Turkey and is one of the world's most spectacular historical sites. The city and its harbour were established on the mouth of the Cayster River and, in the 2nd century BC, became the most important port and commercial trading centre in Anatolia. Alexander the Great ruled over it during the Hellenistic period and it was once capital of Roman Asia under Augustus in 133 BC. Ephesus declined during the Byzantine era with the silting up of the harbour,and by 527 AD it was deserted. 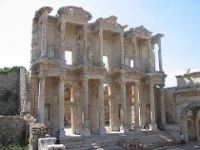 Ephesus is also important as the early seat of Christianity, visited by St Paul, whose letters to the Ephesians are recorded in the New Testament. The site needs little imagination to see what a functioning Roman city would have looked like, but guides are available and can offer a rich insight into the history and architecture of the ruins. Among the amphitheatres, murals and mosaics, baths, fountains, brothels, and columns, the chariot-worn streets lead to highlights like the enormous Library of Celsus, the Temple of Hadrian, a row of public latrines, and the Grand Theatre where Paul preached to the Ephesians. The city was originally dedicated to the goddess Artemis and her once-magnificent temple was considered to be one of the Seven Wonders of the Ancient World. Transport: Ephesus is a nine hour bus ride from Istanbul. Travellers should fly to Izmir Airport and take a shuttle from the airport to Selcuk - from there Ephesus is easily accessible. Opening times: Daily: 8am-6.30pm (in winter the site closes at 5pm).